Located slightly away from the bustling city life, this mesmerizing waterfall is surely going to impress you. 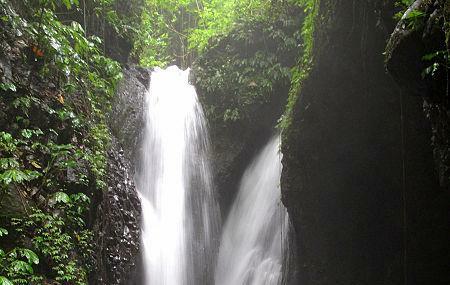 A narrow hiking trail for few distance from the main road connecting Bedugul and Singaraja will lead you to this waterfall. As the 40meter cascade fallsinto a rocky pool, the roaring sound of the water will definitely put you in trance. If you are game, take a plunge into the cool waters of the pool. That’s why, with times, this spot has turned into a must-visit natural landmark for visitors coming to Bali. Hence, missing out on this waterfall will a sheer loss for your Bali trip. Carry your extra set of clothes. How popular is Gitgit Waterfall? People normally club together Danau Batur and Echo Beach while planning their visit to Gitgit Waterfall. Nice Waterfall, the highest one in Bali. Nice little walk to it past a lot of nice little souvenir shops. A bit hard to find maybe, just look for the big sign "to Gitgit Waterfalls". ! The location on google maps is wrong ! It's on the other side of the street. You have to pay entry at the gat, a bit down the walk 20 k for adult and 10 k for child. We parked at the parking area, you pay 2 k for that and they try to be your local guide, but you can easy walk alone. Just over the street and down. Beautiful place. The early morning visit to this place is a must. Shops will be closed and number of visitors will be less so you can see the beauty and capture it well. Best time to visit is October till Feb.
Nice waterfall. Worthy going there. The walk to the waterfall is by a path with local shops on both sides, I've been told it was 1km. The entrance was 20k. Before the entrance, at the parking, I was offered the services of a local guide, he said the money was for the locals to help them to develop. Also, they asked us for 2k for parking the scooter as donation. Just infront of the waterfall there is a nice spot for enjoying the views and maybe having some rest. There is also a toilet in that area, that was 2k (Feb 2019). Staff/Local Guide of Gigit Waterfall request for 500K Rupiah personally for the entrance ticket. The entrance ticket staff also work together with them to request for the 500K money. Be careful.